A Slice of Life: Happy Chinese New Year! 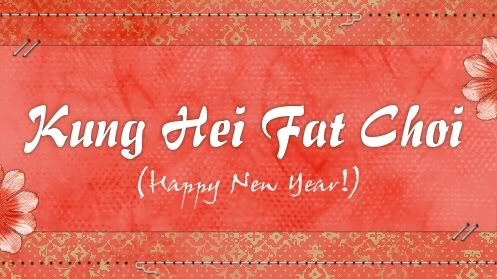 Hello, wanted to greet you all Happy Chinese New Year. Tomorrow, Feb. 3, is already the YEAR OF THE RABBIT. This afternoon, just like the traditional New Year, I cleaned our house in preparation of the CNY. I changed my bedsheet and cleaned the whole house. I don't have lucky charms or fruits on the table but I still hope that we'll be blessed this year. Just wishing for good health and continuous work. I have so many projects for this year and I'm hoping I can accomplish all of them. Buying another desktop pc, digi cam, lcd TV and Seagull lighting are just some of the things I wanted to buy and that will only come to reality if I'll work hard. Anyway, have a safe CNY and happiness to all of us!